The female choir CARMINA was founded in January 1989 in Tallinn. The choir of 30 singers has the repertoire contai­ning older and contemporary Estonian (Kreek, Tobias, Tormis, Mägi, Ernesaks, Sisask, Pärt, Ratassepp) as well as foreign music (by Palestrina, Victoria, Poulenc, Debussy, Schumann, Verdi, Holst, Vic Nees, Rautavaara, Johansson etc) – sacrale and folklore. There are also arrangements of pop in the programmes. The female choir Carmina is a member of Estonian ­Fema­le Song Society. The choir has participated in all Estonian General Song Festivals and Estonian Female Song festivals since it was founded, and in 2000, 2005, 2008, 2012 and 2018 Tallinn contests for female choirs of A-category. In the last competition (March 2018), the choir reached the third place among Estonian female choirs. Carmina has held a big number of concerts throughout Estonia – in churches and concert-halls of Tallinn, in the neigh­bouring countryside and in foreign countries. The Female Choir Carmina has always loved travelling – through time, in songs and music as well as over land and ­water. MARGIT VÕSA – the conductor and founder of the female choir Carmina – studied choral con­duc­­ting at the Conservatoires in Tallinn and in St.­ Peters­burg and she has graduated the Estonian Academy of Music and Theatre as Master of the Music. She has lectured in the Department of Music of the Institute of Fine Arts at Tallinn University as the teacher of conducting. Currently she is working in the Estonian Academy of Music and Theatre. In 1994–2002 Margit Võsa was conducting the Tal­linn Chamber Choir in ad­dition to Carmi­na.­ Before Carmina she had practiced with the mixed choir Sõp­rus and the Aca­d­­e­­mic Female Choir of Tallinn University of Tech­no­lo­gy. Her­ creative research has been related with the fe­male choir­ Car­mina. 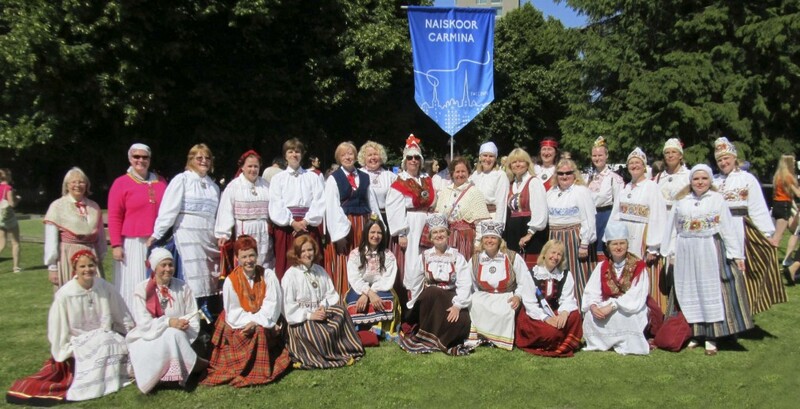 The highest level of achievement for Carmina has been the Orlando di Lasso festival in Camerino in 2003 (gold and silver medals) and the gold medal and Grand Prix cup of the XI International Folksong Choir Festival “Europe and its song” in Barcelona in 2009. Margit Võsa has been one of the general conductors on ­Estonian female song days. Since spring 2014 Margit has been the Head of the Estonian Female Song Society. Ludmilla Dombrovskaja-Keis has been helpful in the voice placing of Carmina singers. Choir has recorded for Estonian Radio and ETV. The choir’s first CD "The Female Choir Carmina" was issued in 2005, the second „Carmina. Near and Far“ in 2011.